So you're using the Linux operating system and you're not concerned with viruses. But you still get SPAM - and plenty of it. With the Evolution groupware suite you have, by default, Spamassassin as your Junk filtering tool. For some this is enough. For others, howerver, it doesn't cut it. For those that need more you can give Bogofilter a try. You can use Bogofilter in conjunction with Spamassassin but that setup can become quite cumbersome and will require the creation of filters. To avoid this we will use only Bogofilter and we will train Bogofilter out of the box so it's working right away to prevent SPAM from reaching you inbox. With a little preparation this setup will go quickly. Without preparation, it will take some time for Bogofilter to learn SPAM/HAM. The easiest way to train Bogofilter is to have a collection of SPAM and HAM ready (approximately 200 each for training purposes) for it to use in the training process. These will be placed in SPAM and HAM folders (respectively) to be used once Bogofilter is installed and ready. But before you get to that point, you need to install Bogofilter and the Bogofilter Evolution plugin. To install the necessary items open up your Add/Remove Software tool. Within this tool do a search for "bogofilter" (no quotes). You should see two particular pieces of software to install: bogofilter and bogofilter-evolution. Mark both of these applications for installation and click Apply to install them. After they are installed you are ready to set up Bogofilter. The first thing to do is to enable the Bogofilter plugin in Evolution. Click on the Edit menu and select the Plugins entry. In this new window that opens click the Bogofilter check box to enable to plugin and then close the window. Now that the plugin is enabled, it's time to configure it within Evolution. Go back to the Edit menu and select Preferences. 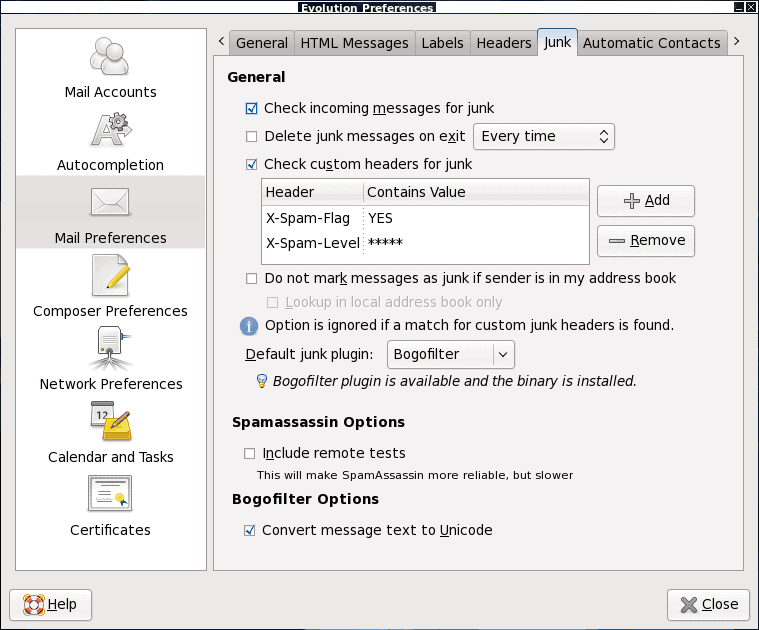 When the Preferences window opens up click on the Mail Preferences button and then the Junk tab (see Figure 1). From within the Junk tab the first thing to do is to select Bogofilter from the Default Junk Plugin dropdown. Now go back to the top and make sure "Check incoming messages for junk" is checked. Close this window after you have completed these steps. Now you are ready to train Bogofilter. A lot of people complain that Bogofilter doesn't work well. The main reason it doesn't work well is because it hasn't been trained. Remember those SPAM and HAM emails you collected in the SPAM and HAM folders? Now you are going to use them. First click on the HAM emails. These are all good emails (not SPAM). Select all of these and mark them as Junk. I know it sounds crazy, but it's necessary. Now click on the Junk folder and you should see all of those emails you just marked as SPAM. Select them all again and mark them as Not Junk. Bogofilter just learned what you consider to not be junk. Now click on the SPAM folder, select all of these messages, and mark them as Junk. That's it. Bogofilter should now be trained properly. And remember the more training you give Bogofilter, the smarter it will be. Bogofilter is a great tool for keeping SPAM out of your inbox. And best of all, it doesn't require you to open up a terminal and issue a bunch of commands in order to get it working properly.